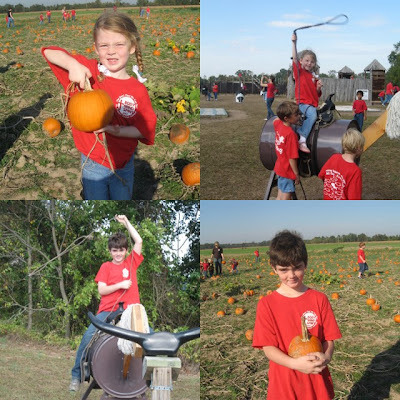 We went to the Pumpkin Patch on a field trip with the kiddos school. This was the first year that this trip wasn't canceled because of bad weather. It was a beautiful, fun day! Clark and his cousin Charlie. They are in the same class. In fact his Mom is my best friend from College and his Dad is my sweet hubby's first cousin. We meet at their wedding June 11, 1999. We rode on a wagon to pick a pumpkin. I gave mine to Will Henry. He loves pumpkins, he calls them "pumps". Soooo Cute!!! They also loved this lasso area. Miss Bella Ruth watching the pig races. See you next summer "Beggs Farm" for some Strawberry picking! !